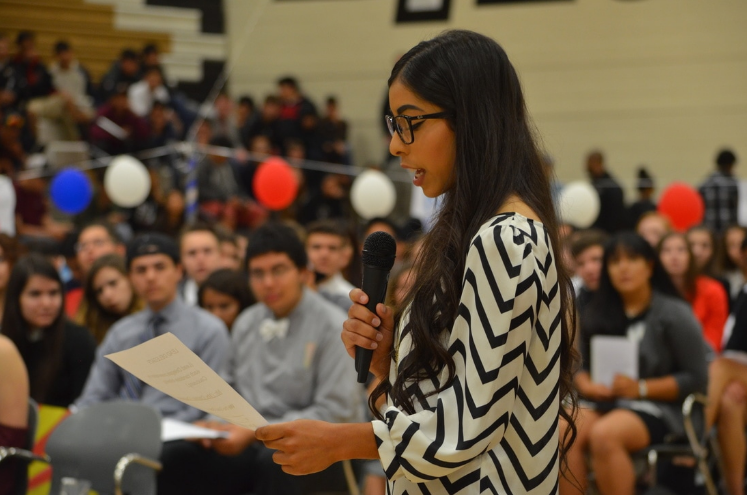 Lead Delegate of California Mellanie Valencia reads off their final vote for ASB candidates. McDaniels is the Supervisor of District 3. He represents Atwater, North Merced, Franklin-Beachwood and McSwain. McDaniels speech brought a close to the opening ceremonies. ​ Hobbs then began the voting process. With this, each candidate came up to the podium to present their speech. They persuaded the delegates with reasons of why they were running and what they would be doing to better our school. Karlee Hobbs, candidate running for Director of Publicity, states, “It felt very natural presenting my speech. I actually felt as though I was talking to them [the delegates], not just reading off my speech to them. 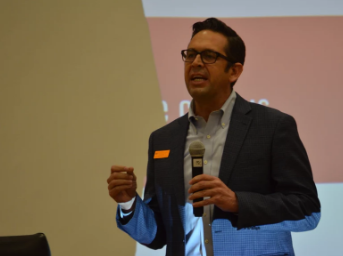 When you make a connection with your audience it makes it easier to present.” After each speech the delegates were called on to ask any questions that they had for the candidates. When all candidates running for the same office had presented their speeches, delegates received five minutes to discuss amongst themselves and come to a conclusion. Each state was then called upon to report their final decision. Hobbs then began the voting process. With this, each candidate came up to the podium to present their speech. They persuaded the delegates with reasons of why they were running and what they would be doing to better our school. Karlee Hobbs, candidate running for Director of Publicity, states, “It felt very natural presenting my speech. I actually felt as though I was talking to them [the delegates], not just reading off my speech to them. When you make a connection with your audience it makes it easier to present.” After each speech the delegates were called on to ask any questions that they had for the candidates. When all candidates running for the same office had presented their speeches, delegates received five minutes to discuss amongst themselves and come to a conclusion. Each state was then called upon to report their final decision. Merced County Supervisor Daron McDaniel presents his keynote speech. After the election convention, the top two candidates for each office will move on. There will then be a school-wide vote to decide who will be presenting this school as ASB officers. Principal Lance Morrow states, “We will most likely continue on with this in the upcoming years. I like the process and how it teaches the students about the government. Next year we hope to have more representation of the people as delegates.” Now it is up to the students to decide next year's future.